Current status of the Tubby Tug. Had to hold up starting to build 'til after finishing building the shelves shown in the background. This became necessary after having a 2 ton Air conditioner installed in the garage so now I can work in comfort. Progress to date on the Tubby Tug. Outside finished. 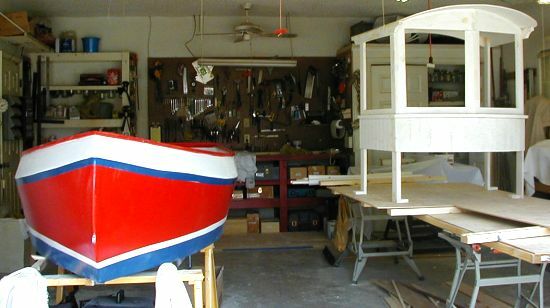 Now paint inside and assemble the cabin. Purty ain't she. Know you've been dying to know how the TUBBY TUG is coming along. Well maybe not dying to know, but curious? No? Don't care? Whatever... Here she is with all construction finished and the first of two prime coats applied. Now for another primer and then 3 coats of finished paint. 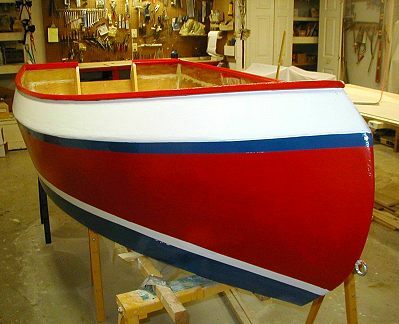 Cabin will probably be red with blue top and hull is finished except for a little "touch up". That monstrosity on the bench is the cabin that will fit in once the final paint is applied. Easier to do out there then on the boat.